Guardians of the Galaxy Vol. 2 opens on screens Friday. GUARDIANS OF THE GALAXY VOL. 2 earns a rare distinction. It joins a list of films - THE EMPIRE STRIKES BACK, INDIANA JONES AND THE LAST CRUSADE– that equals or outdoes a predecessor. 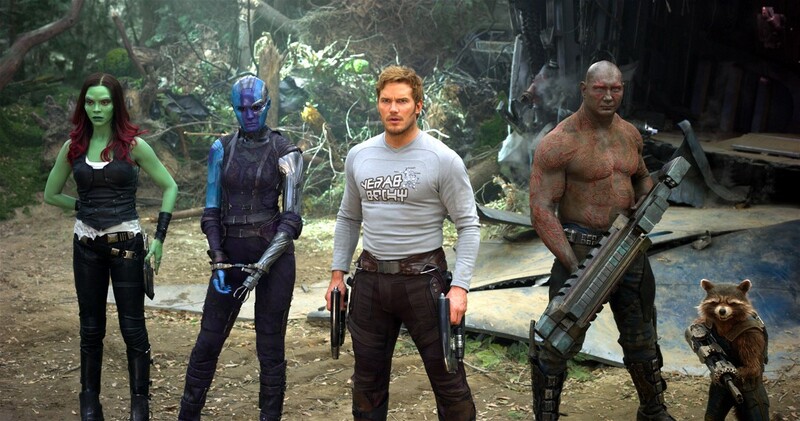 GUARDIANS, from its funky universe to quirky characters, makes you crave more of them (apparently fans will have to wait until the next Avengers films). 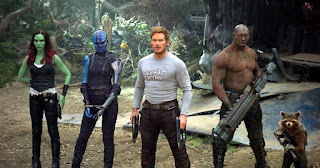 After its status as a surprise breakout hit several summers ago, everyone knows who Peter Quill (Chris Platt), Gamora (Zoe Saldana), Drax (Dave Bautista), Rocket (voiced by Bradley Cooper) and Baby Groot (voice by Vin Diesel) are. Let’s face it, it’s difficult to even pass by it when the flick in on any cable station. They’re misfits, friends and families. That last one is their most important attribute, because writer-director James Gunn, back for his second go around, takes that simple premise and uses it to make Guardiasn’ heart beat. This time out the group takes a job-for-hire for Ayesha (Elizabeth Debicki) and complete it. The only problem: Rocket can’t keep his paws off of some valuables, helping himself to them and quickly making the Guardians wanted by her planet. They’re pursued and the Guardians are forced to crash land on a planet. Unbeknownst to them they’d been tracked by a guy named Ego (Kurt Russell). Ego’s been searching for Quill for years because he’s his father. I’ll spare everyone any semblance of mystery – not that there’s much to deal with respect to this storyline. Ego is Quill’s long lost Dad, but as touching as their meeting is, there are some serious questions involved with the duo’s relationship. In the meantime, as Quill revels in the newness of having found a proud papa, the relationships around him begin to very openly deteriorate. No, the film isn’t overly “soft,” but it does have its heart in the right place and Gunn’s use of music in the film’s soundtrack only enhances that feeling. He also successfully moves the characters along slowly, but noticeably in that the audience sees the evolution. As for those characters: the cast chemistry is infectious and spills over to the audience in that people enjoy spending time with these people. Is there a flaw here or there? Yes, Gunn could have ensured certain plot elements were clearer, but there’s nothing overtly damaging to see. GUARDIANS OF THE GALAXY VOL. 2 glides right along in its galactic groove. Just move with it. Cast: Chris Platt, Zoe Saldana, David Bautista, Bradley Cooper, Vin Diesel, Michael Rooker, Elizabeth Debicki, Sylvester Stallone. Rated: PG-13 for sequences of sci-fi action and violence, language, and brief suggestive content.